Drinking water, insect spray and sturdy footwear recommended. Bring your camera equipment for our unique early-evening to dusk photographic opportunity! Our meticulously restored antique trolley cars are a delight by day and lit-up jewels by night. Those on display with their lights on will include: Car 775 Connecticut, Car 850 New Orleans, and Car 948 Atlanta (check out the red glass.) Probably a few special cars as well! A number of short run-bys and still set-ups will be done on the pristine Branford marsh trestle/ curve area and in the carbarn-yard area utilizing various photogenic trolleys. Free parking at the Sprague Visitor’s Center. 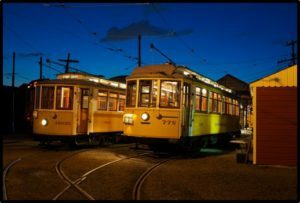 Come early and photograph the trolleys in daylight and twilight! Sturdy shoes, water and insect repellent suggested. Photo submittals, possibly to be included on our website (with your name for credit) are encouraged after the event and may be sent to: info@shorelinetrolley.org.